Bank Receipt form is used to enter receipts in the form of cheques, DDs or any other bank forms. 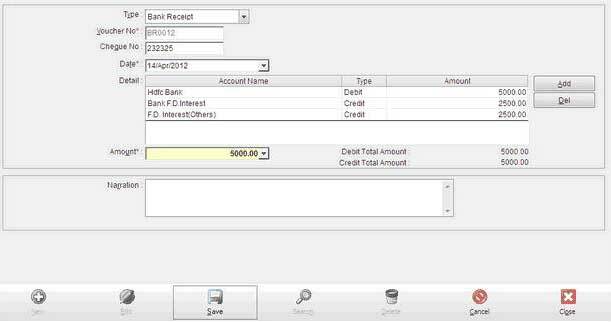 Basically, this module helps you to manage all your transactions related to cheque or any other such bank transaction. 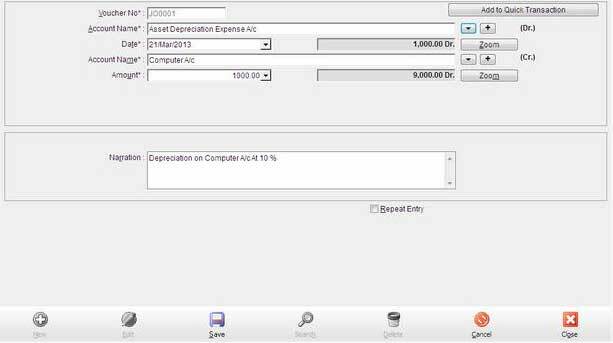 You can add the specific cheque no , select the account where it should make an effect , the amount, the date, after saving you will be able to see a change in the ledger account when you click the ZOOM button. Invest Plus gives you a facility to select the entries from the ledger account, double-click on them on which you will be taken to the entry level module where you can edit the entry as per your requirement. Voucher No Auto generated Voucher number. 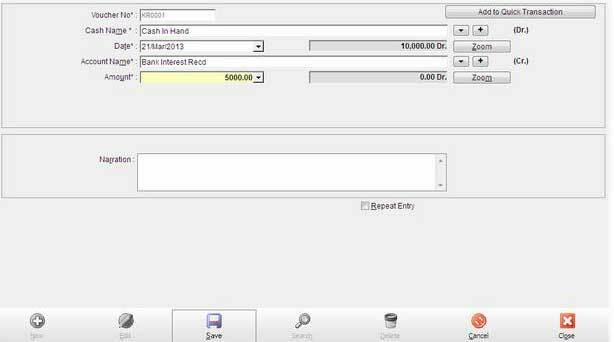 Bank Name Select Bank Account with Select Button or Create New Bank Account with Plus(+) Button. Date Enter date of Receipt here. Cheque Number Enter Cheque No here Optional entry. Account Name Select opposite account with Select Button. Amount Enter Receipt amount here. Must Enter positive value. Zoom Zoom Button displays ledger of the selected account. 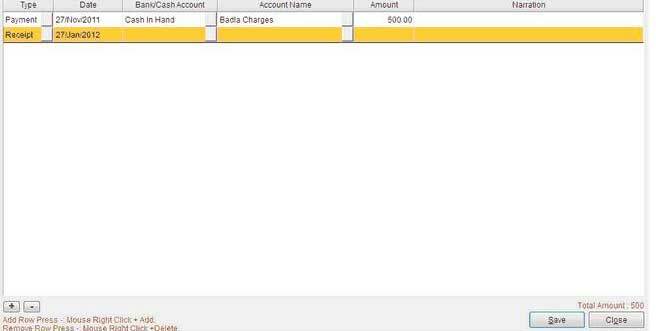 Add to Quick Transaction Now you can enter current transaction in quick transaction by press add to quick transaction. If you select some particular account than you must enter some additional detail. All entries are described below. Bank F.D.Interest Select F.D. number from list. All number’s are comes from F.D. in investment. F.D. Interest(Others) Select F.D. number from list. All number’s are comes from F.D. in investment. Deb. Interest Recd Select Script name and enter qty entry. NSC INVESTMENT A/c Select NSC from list. Bank Payment works the same as Bank Receipts the only difference is that this would deduct amount from the total balance which you have and show its effect when you click on the ZOOM button on which the Ledger Account sheet would appear. Date Enter date of payment here. Amount Enter Payment amount here. Must Enter positive value. Zoom By Zoom Button display ledger of selected account. You can use Cash Receipt when you want to record any cash payments that you have received, the other features remain the same. Cash Select Cash Account here with Select Button. Amount Enter your amount here. Must Enter positive value. Repeat Entry (Check Box) If you want to repeat current entry next time than check mark Repeat Entry Checkbox and then Save entry. you can also edit a current entry and save it as a new entry by using Repeat Entry. Deb. Interest Recd Select script name and enter qty in qty entry. Shares Dividend Recd Select scrip name from list than enter quantity and TDS amount here. 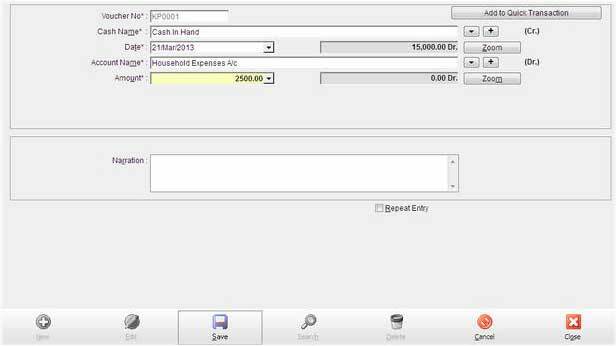 Cash Payments entry mode is used to record cash payments which you have done . Invest Plus gives you this facility so that you have a clear idea of where your money is going. Cash Select Cash account from list. Zoom By zoom display ledger of selected current account. Repeat Entry (Check Box) If you want to repeat current entry next time than check mark Repeat Entry Checkbox and then Save entry. If you don’t check mark then after click on save button you get all entry blank. Some entries can be entered in two ways. For Example: if you withdraw cash from the bank, the transaction can be recorded either as a cash receipt or as a bank payment. These types of transactions are called contra entries. You can enter bank to cash, cash to bank, bank to bank, and cash to cash entry. Debit Account Select bank/cash from list. Credit Account Select bank/cash account from list. Journal Entries are passed for those transactions, which are not of the nature of cash, bank, sales and purchase. Debit Account Select Debit Account from list. Date Enter date of journal entry here. Credit Account Select Credit account from list. Amount Enter amount here. Must Enter positive value. If you select some particular account than you must enter some additional value. In which entry that things are happen describe below table. Bank F. D. Interest Select F.D. number from list. All number’s are comes from F.D. in investment. 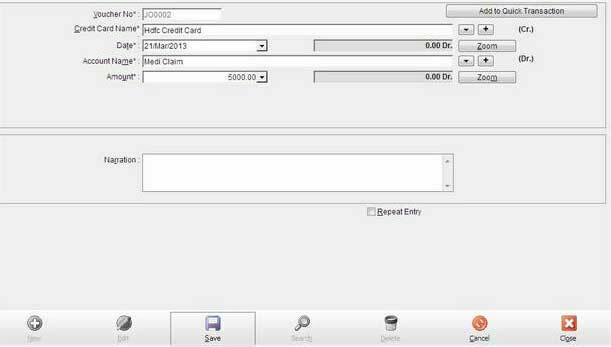 Credit Card Entries this is new feature for manage your Credit Card transaction, Now you can manage your Credit Card payments entry in this module. Credit Account Select Debit Account from list. Date Enter date of credit card entry here. In Personal accounts, you need to transfer all your Income & Expenditure A/cs to Capital account at the end of the year. This requires passing a number of journal entries. 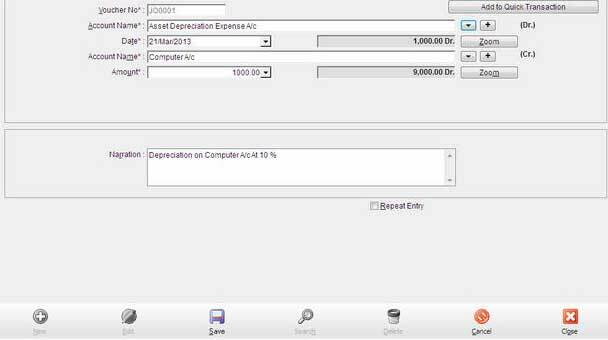 In this module, the system shows you all the items of Income & Expenditure and allows you to select all or any of them and transfer these accounts by a single click! In case you make any changes after passing transfer to capital account then make this transfer again and the system will update all the accounts. For cancelling the transfer of entries to Capital A/c, click transfer to capital a/c in this module without selecting any entry meaning the check – box at the end of all the entries. Bank reconciliation is required to reconcile the difference in the bank balance as per your Bank Book and the Bank Statement or Pass Book on a particular date. The difference may arise if some cheques deposited by you are not cleared or cheques issued by you are not yet presented before the bank. Select Bank name and Period and then press [Recon. Processing ] to start the Bank Reco. processing. All the transactions entered by you will appear date wise. 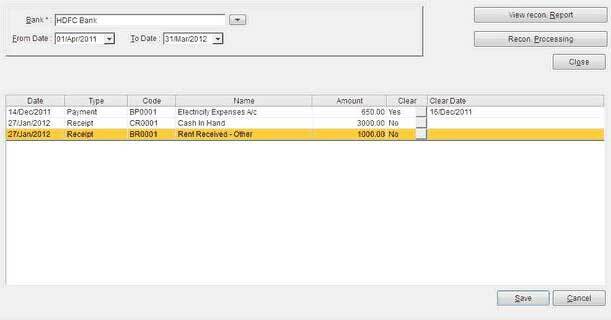 Now you can mark for those receipts or payments which are appearing on bank passbook by clicking [Clear] column. You may also put [CLEAR DATE] if you want. In case any charges are directly debited by Bank or any credits or deposits have been received directly into bank then pass the necessary entries to update your bank accounts. Saving Bank Reco. 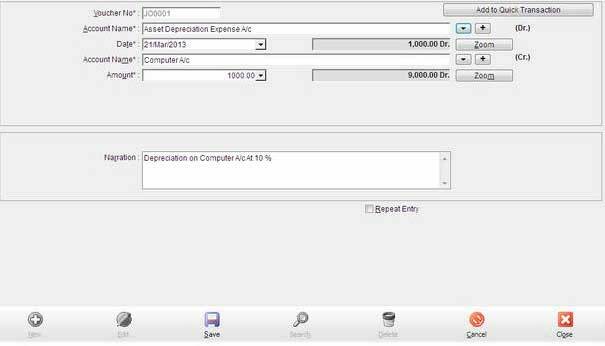 processing and press [ View Recon Report ] to get the bank reconciliation statement for the selected period. This is one of the key features of Invest Plus, you can enter any bank/cash entry etc from the given module, the main benefit of this feature is that you don’t need to do change different account daily entry modules. Entries of the different modules from one module, the complex process of maintaining Account Entry is now made easy. 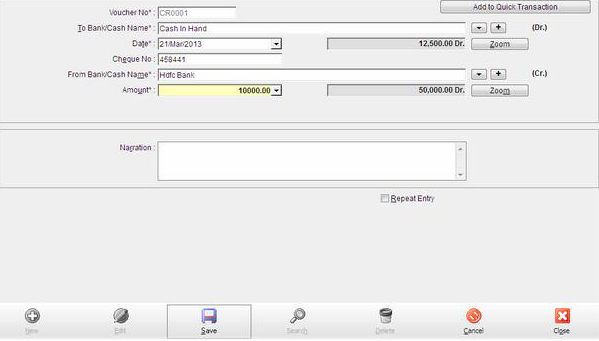 Bank/Cash Account Select Bank/Cash Account with Select Button or Create New Bank/Cash Account with Plus(+) Button. Date Enter date of transaction here. Amount Enter transaction amount here. You can enter any Account daily entry with multiple Debit/Create Accounts in this module, the complex process of maintaining Account Entry is now made easy.